Aurora boreali and Sub Auroral Arcs- For most Canadians, night time means winding down, getting ready for bed and calling it a night. Not so with a passionate group of northern lights chasers, scattered throughout Alberta, Manitoba, and BC and even some dedicated northern US folks too. 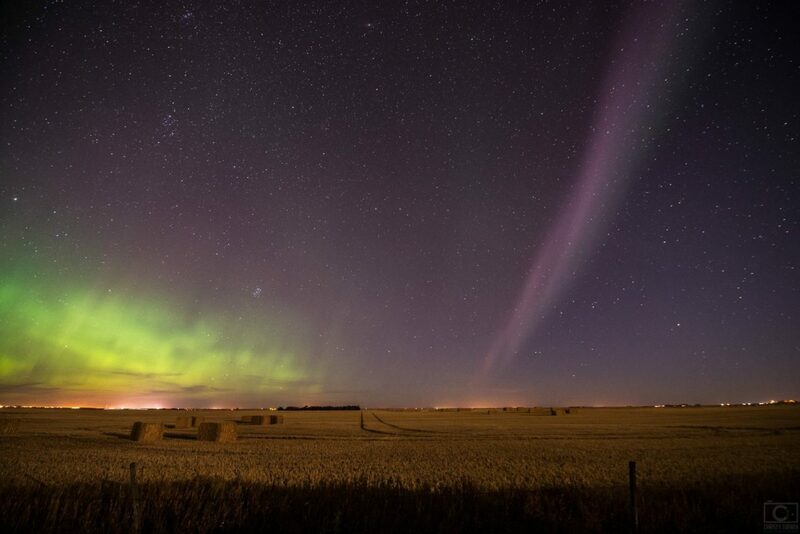 Aurora Chasers, as they’ve affectionately come to be called, are heading out into the dark prairie night, in search of the elusive aurora borealis lights that can light up the Canadian skies with great fervor. With many thanks due to the collaborative abilities from the onset of social media, northern lights enthusiasts can follow solar data, share photos and tips, and get real-time, on-the-ground live updates from people located all over these provinces and even some northern US states. 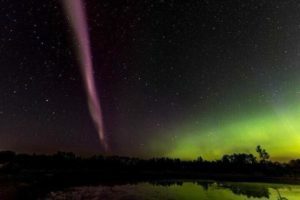 The popularity and general public awareness of chasing northern lights has skyrocketed in the past couple years, with groups like Alberta Aurora Chasers and Upper Midwest Aurora Chasers having memberships in the thousands, containing people scattered all over North America interested in the northern lights. For some of these night owls, it’s simply hoping to get an opportunity to see the magnificent lights on display to cross it off a “bucket list”, show their children, or perhaps visiting friends from out-of-town. For others, it’s become a popular photographic pursuit- to get the ultimate night photo showcasing these amazing lights, where it’s never the same show twice. Although currently the sun (which is wholly responsible for producing these amazing lights) is in a solar minimum, there is still some occasional solar activity annually that gets the skies alight. Although Alberta’s aurora chasers number in the thousands now, northern BC’s favourable geomagnetic latitude means there’s plenty of chasing there as well! Just ask Anna McCue, who lives on a farm in Mud River, just outside of Prince George. Anna too, is a passionate aurora chaser and photographer. When asked what draws Anna to the northern lights, she remarked “Peace, the quiet. There’s noise all day and I’m a introvert at heart. It’s a rush to be under the night sky”. Team Tanner, a talented couple in Alix, Alberta who photograph all things sky, have received considerable attention in media for their passion. When asked what draws them to the mysterious night sky, Dar Tanner exclaims “We don’t want to miss the amazing beauty of the dancing lights.” This dedicated duo have traveled even to Iceland to get that much closer to their beloved auroras! 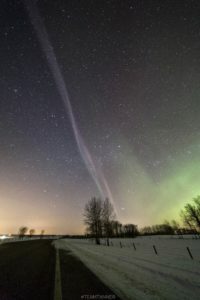 Auroras, and in particular, sub auroral arcs have been given special attention lately with media noting that these arcs are “newly discovered”-subsequently (and most cringingly) named “STEVE” by some local Alberta citizens. Could a less scientific name exist?!) 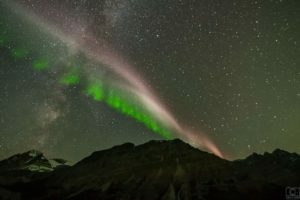 In actuality, these sub auroral arcs have been well known and written about for decades by the science & research community at large and certainly nothing new, with a number of published studies dating back to the ‘60s. Not sure how this was missed! Certainly, there’s no question that these newly engaged citizen scientists are adding valuable data and photographic sightings to the scientific community. However, to state that sub-auroral arcs are some fantastic new finding, and then dubbing this old-not-new phenomenon “STEVE” is both misleading and most certainly seemingly inaccurate, at least from a documented-previously-by-a-number-of-credible sources perspective! Science is about discovery, and referring to these sub auroral arcs in their scientific terms, rather than a cringe-worthy moniker created over beers. “STEVE”, despite it’s status as a social media darling, is in fact, simply a decidedly new, unscientific nickname/acronym associated to a well studied, documented and discussed aurorale phenomenon for decades! The very foundation of science is in fact, knowledge as well as a process for discovering new knowledge, and it often replaces the old knowledge. 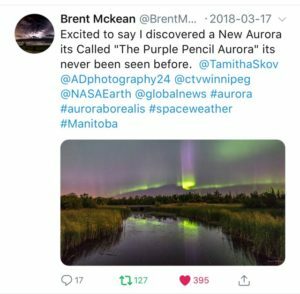 For certain, Canada’s aurora chasers (and others worldwide) are definitely making a key contribution to the ongoing study of the Aurora Borealis and it’s sub auroral arcs, without a doubt. Absolutely, the collective work of this group of citizens and photographers have made entirely valuable contributions by documenting with sightings, photos and sharing of information. But it’s quite arrogant to presume that Alberta citizens are alone in our efforts, and even more silly to proclaim these arcs have just been discovered! Not so! In fact, similar groups of interested and enthusiastic citizens exist in Tasmania and those chasing the Aurora Australis, just a short hop over to the other side of the pole, or in beautiful northern countries like Iceland, Finland, Sweden, Norway, Russia, Siberia. Some equally devoted Scandinavian photographers have made well documented references to these arcs years back. I can only imagine how the seemingly more refined international community have viewed this screamingly insecure clamour for media attention for this moniker that should have never been. Many feel it’s detracted from the credibility by choosing such a childish name rather than sticking to what science had already decided to call it,a sub auroral arc, long ago, sorry kids! Nonetheless, thanks to countless people dedicating themselves to the pursuit of the art of the nights, the aurora and it’s sub auroral arcs are being documented worldwide in an unprecedented fashion. Understanding how to chase the aurora is a science in itself. The northern lights occur anywhere from 100-300 km in an auroral “oval” above the earth. This oval is several thousand kilometers in diameter encircling each of the magnetic poles of earth. Alaska, Northern Canada, northern Europe and Asia are the most likely places you’ll see the aurora. The aurora oval is not static- and the side that is opposite the sun tends to be the greatest distance from the magnetic pole, which means that the aurora will be most visible around midnight for any location it’s being observed in. As the geomagnetic activity intensifies, the oval size also increases which in turn increases likelihood of seeing it from more southerly latitudes. Think of it like running water in your bathroom sink- the more you turn up the water, the more it spreads across the sink. The northern lights work the same way- the more intense the activity, (a combination of the direction of bz, bt for density (colour), hemispheric power, the stronger the lights can be, spreading southerly. The sub auroral arcs usually run across the sky east to west, parallel to the rest of the aurora display. Social media groups allow for rapid sharing of information, and real-time reporting, making the opportunity to see this earthly phenomenon including the sub auroral arc, that much easier to accomplish! 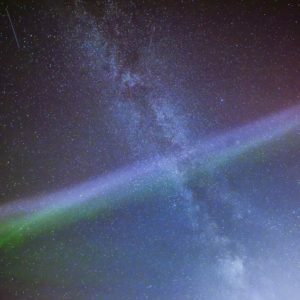 DI am aware of the existence of a 24/7 chat comprised of about 15 very dedicated photographers and night sky lovers, spread anywhere from Alaska and Northern Alberta all the way down to Minnesota and beyond. This chat is affectionately called High Rollers Club and when it’s happening, they talk aurora on demand, all the time, administered by one of the most dedicated, tireless researchers out there, Brian Slattum, the group founder of UMAC, (Upper Midwest Aurora Chasers group- definitely one of the best groups going on aurora chasing, with a large Canadian contingent!) who is relentless when it comes to getting to studying the aurora. If ever the term citizen scientist applies, it applies to this group’s administrators. Be sure to check out Great Lakes Aurora Hunters, and Aurora Australis Tasmania for other fantastic social media communities with reliable data and fact-checking. In the coming weeks I’ll be blogging more about the chase and photography of these beautiful lights of the night, profiling some of the people behind the photos.